All eyes were on the weather on the final day of NADA. Not the weather in San Francisco, but elsewhere across the country. Forecasts of snow and sub-zero temps made some wonder whether they’d get out of town as planned. A different kind of competition: Through multiple conversations, it’s become crystal-clear that today’s competition is different. It’s no longer just the other dealers in your market you have to worry about. It’s brick and mortar dealers outside your market, as well as disruption- and online-minded retailers who are targeting your customers, and their cars. Today’s competitive playing field also isn’t just about who’s got the right car and the right price. More and more, in the minds of consumers, it’s who’s got the right car/price, and how do they sell it. Is it easy? Fast? Maybe fun? These experience-rooted considerations are the seeds for the differentiation dealers will need to earn sales and service business. Two-way partnerships: For a very long time, dealers have experienced (or endured) what could be described as one-sided partnerships with some factories and solutions providers. If the partnerships were a stick, dealers typically held the short end. With factories, it seems to me they will face palpable push-back against factory facility investments and mandates that don’t make sense for dealers when you consider where customer preferences, and the retail market, is headed. With solutions providers, dealers are in the driver’s seat in ways they may not have been before. As evidenced by the offerings at NADA this year, dealers have more choices and options. It’s an environment where dealers can, and should, go with providers who offer true partnerships, where the respective hands hold the stick in balance, and the cost to value ratio is clear. A bullish view: There was some discussion about Zotye USA naming nearly 20 dealers at NADA to represent the Chinese manufacturer and retail its vehicles. The company’s plans reportedly call for stores in 80 markets, with sales beginning late next year. Meanwhile, outgoing NADA Chairman Wes Lutz says dealers are “writing the future” with an eye for new opportunities and a thirst for/willingness to change. You have to appreciate the bullish nature of Lutz’s comment, and Zotye’s retail plans. 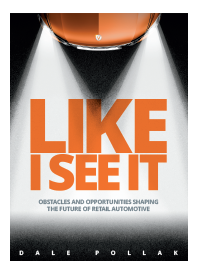 Together, they affirm something I’ve said for a long time—as you consider the future of retail automotive, it would be unwise to bet against dealers. ProfitTime progress: I made a commitment as I left San Francisco, where we officially launched vAuto’s Provision ProfitTime methodology and metric, to chronicle its progress in this space and beyond. I look forward to sharing the stories of dealers using ProfitTime to regain their gross profits in today’s era of margin compression. My thanks to all who stopped by the vAuto and Stockwave booths, and a special shout-out to Cox Automotive, vAuto and NADA for helping me honor my 50th year of attending NADA conventions. This one felt special, and I’ll be riding its positive energy all the way home.